Joseph H. Olaynack, III joined the firm as an associate in 1998, and has been a shareholder since 2002. He represents, advises and counsels individuals, families and small to midsized businesses and nonprofit organizations on a wide variety of civil matters, with a current emphasis on business and commercial law, residential and commercial real estate transactions, estate planning and probate and trust administration, condominium law, and municipal property taxation. He also continues to represent clients in selected matters in state courts and before administrative agencies. 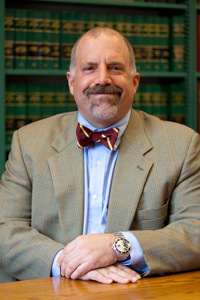 Joe has experience in nearly all aspects of civil practice, including, in addition to the above practice areas, landlord-tenant law, condominium law, municipal law, zoning and land use law, environmental regulatory compliance and permitting, labor and employment law, intellectual property, construction law, debt collection, personal injury, and criminal defense. He is also responsible for many aspects of the firm’s management and operations, including budget and financial administration, personnel matters, planning and technology. Joe is admitted to practice in Rhode Island, and is also admitted to practice before the United States District Court (Rhode Island) and the United States Court of Appeals (1st Circuit). He is a member of the Rhode Island Bar Association, the American Bar Association and the Newport County Bar Association. Joe is a 1987 graduate of Worcester Polytechnic Institute in Worcester, MA, where he majored in civil engineering, and a 1997 graduate of Boston College Law School in Newton, MA. Prior to practicing law, Joe worked as an engineer and a project superintendent on a number of large scale public and private projects for the largest dredging and marine construction company in the United States. While in law school, Joe served as a part-time management consultant for KPMG Peat Marwick’s Government Services Group, where he advised the firm’s clients on a variety of environmental compliance matters. Joe is very active in his community. He is a Corporator of Ocean Point Financial Partners / Bank Newport, a member of the Trustees of Long Wharf and Public Schools, and a Governor of Newport Health Care Corporation / Newport Hospital, where he also serves on the Finance Committee. He has served on the Board of Directors of the Women’s Resource Center of Newport & Bristol Counties and the Newport County YMCA, where he remains a member of the Governing Member’s Council. Joe has been a volunteer and coach for many years with the Middletown Youth Soccer Club, the Middletown Little League, and the Middletown and Newport Babe Ruth Baseball League. He and his family are supporters of and involved with many other local charitable and civic organizations, including St. Columba’s Church, the Middletown Education Collaborative, the Newport Public Education Foundation, the Aquidneck Land Trust, the Norman Board Sanctuary, Save the Bay and the Newport Children’s Theatre. Corcoran, Peckham, Hayes, Leys & Olaynack, P.C.